In 2016, the ANZAC 100 Mackay Remembers: Field of Poppies Project received the Queensland School Library Association's Brian Bahnisch Award. The facilitator of the project, Margaret Spillman, shares her story, and how the community worked together to commemorate the ongoing Anzac centenary in a meaningful way. During the lead-up to the Anzac Centenary I wondered how we as a school community might honour the memory of those who served. In particular, I wanted a way for our students to be actively involved, as the future of the Anzac traditions lies in the hands of our young people. I was inspired by the Sea of Poppies outside the Tower of London. While the poppy might commonly be used for Remembrance Day, I decided to use it for our project as well because it is such a strong visual symbol for all those who served. My concept was that students would create a poppy using a red plastic plate. This would have a soldier’s name written across the front. It would be attached to a bamboo stake and ‘planted’ on the front lawn of the Mackay Regional Council building in the week before Anzac Day 2015. I pitched this concept firstly to my Principal, Mrs Rae Lee Cox, who was supportive, and then to the local teacher librarian network, which was very enthusiastic and keen to be involved. Next stop was our local council. Mayor Deirdre Comerford and all councillors were interested in a partnership with schools. The following state schools participated: Mackay West, Walkerston, Slade Point, Eimeo Road, Mirani, Alligator Creek, Mackay North, Mackay High, and Fitzgerald. Mackay Christian College and St Mary’s Catholic Primary School also joined the project. Finding sponsors was the next challenge. I was encouraged by the fact that our concept resonated with individuals and businesses wherever I went seeking practical and financial support. Both Bunnings at Paget and Woolworths at Ooralea have a strong commitment towards community involvement and provided either funds or materials at heavily discounted prices. Bunnings provided the bamboo stakes and Woolworths the red plastic plates. Bunnings Activities Organiser Kylie Webster also provided practical support and even visited Mackay West to work with students. Woolworths Ooralea’s Manager, Amber Issinger, worked closely with us to advance the Anzac 100 project. RSL (Queensland Branch) Pioneer-Fitzroy-Highland District generously provided funds for the purchase of materials. A Mackay West parent, Sidonie Cromb, created an enormous one metre by two metre display banner, almost free of charge, through her Howling Mouse Graphic Design Studio. Other support was provided by Mackay Regional Council staff. The end result was that the materials were provided cost-free to all eleven schools; no mean feat. 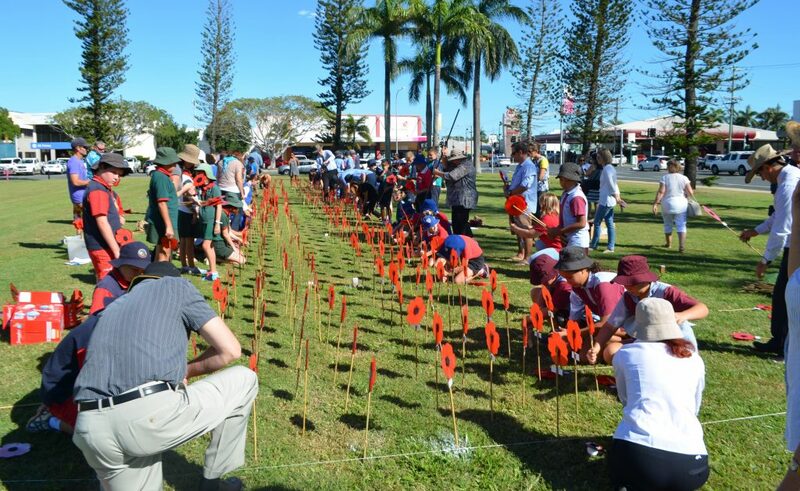 In glorious autumn sunshine on Friday 24 April, 2015, Mayor of Mackay Deirdre Comerford welcomed a large contingent from eleven Mackay and district schools keen to plant 1,592 hand-made poppies (one for each World War I volunteer) on the lawns outside Mackay Regional Council. It was fitting that the mayor formally welcomed everybody, as she and her fellow councillors had enthusiastically supported the Field of Poppies project since the idea was first floated. Led by teacher librarians and library staff, planting went smoothly and enjoyably, thanks also to the hard work of dedicated council staff Annette Reilly, Tracey Harvison and Kathleen Price. All media outlets covered our Field of Poppies project. Sponsor representatives included Kylie Webster from Bunnings Paget, who gave much practical assistance, and Lynette Ney from the Mackay Pioneer-Fitzroy-Highland District RSL, which gave financial assistance. Mackay Regional Council, also a major sponsor, provided additional people for the planting and the security needed. Our poppies remained overnight on the council lawns until the conclusion of the Anzac Centenary Commemoration service the next day. The poppies were a glorious visual spectacle, a slash of brilliant red across the expansive green council lawns, a fitting memory to those brave World War I volunteers. 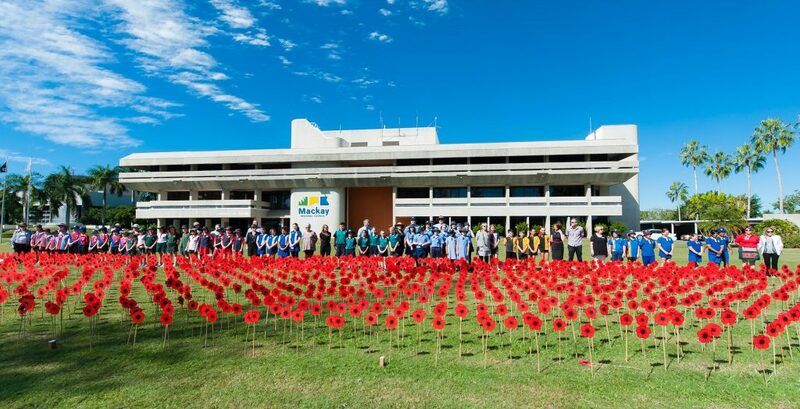 For the thousands who either participated in or watched the Centenary Anzac parade on Saturday 25 April, the poppies were a very poignant reminder of the great personal sacrifice and courage of Mackay and District volunteers. The public’s engagement with the Field of Poppies was amazing. Families found poppies of loved ones, and many personal wartime stories and memories were shared. The organisers were also asked to make additional poppies for some families as a personal reminder. This article was originally published in the November 2016 QSLA newsletter. Published here with permission.